Supergrid will get a wider, theatrical showing this December. This post-apocalyptic thriller already had its World Premiere, at the Calgary International Film Festival. This title also had a release at this year's Blood in the Snow Film Festival. In the film, two brothers move some cargo, across a dangerous wasteland. A trailer premiered for the film earlier this year (found below). 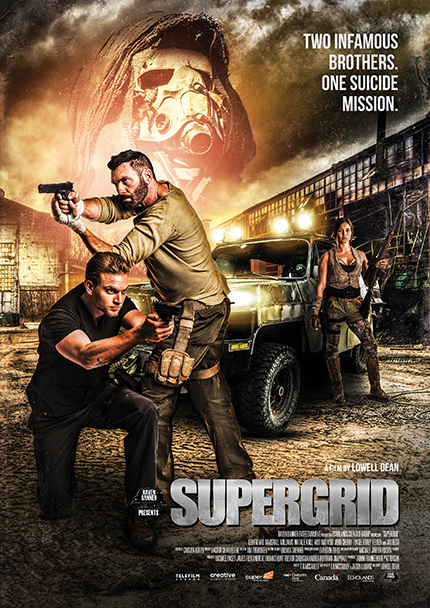 And, Supergrid was developed by Canadian director Lowell Dean (WolfCop, Another WolfCop). The cast consists of: Marshall Williams (Channel Zero, 2017), Natalie Krill ("Wynonna Earp"), Jonathan Cherry and WWE star Jay Reso. A preview of the film's wider Canadian release is hosted here. Supergrid will show in at least three Canadian cities. On December 14th, this thriller will show in: Calgary, Toronto and Ottawa. Canadian distributor Raven Banner Releasing will be handling the launch. All of these showings will last for at least one week, with the Calgary launch lasting two weeks. Canadian fans will have a few more opportunities to see the film in just a few weeks. Director Lowell has talked about the film, at the Blood in the Snow event. He said of the film and the shoot: "with Supgergrid I was given a chance to direct a post-apocalypse movie on the prairies with a timely story, lots of action and a killer ensemble cast. It was a challenging shoot but the whole team put their blood and sweat into every frame (Screen Anarchy)." Some of that blood and sweat can be seen in the trailer, below. And, more theatrical details are also inside. Release Date: December 14th, 2018 (Canadian Theatrical). Writers: T.R. McCauley, Justin Ludwig. Cast: Leo Fafard, Marshall Williams, Natalie Krill and Jay Reso. *the film will show in the following theatres: Toronto - Carlton Cinema (one week engagement), Calgary – Globe Cinema (two week engagement) and Ottawa – Mayfair Theatre (one week engagement).